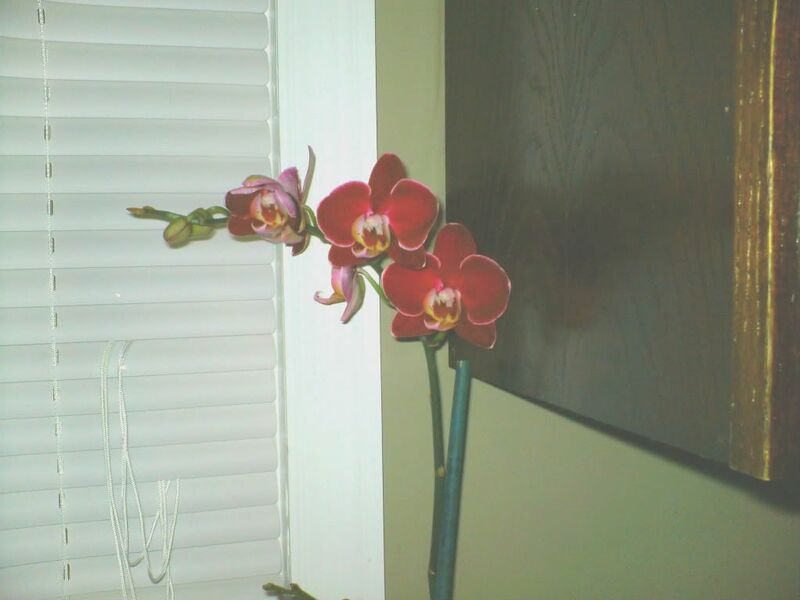 That's a very dramatically colored phalaenopsis (sometimes also called a "moth orchid," but I don't know why ). I am a phalaenopsis addict. I started about 20 years ago with a purchase from Home Depot, now I travel to orchid shows. Yours is a beautiful color! 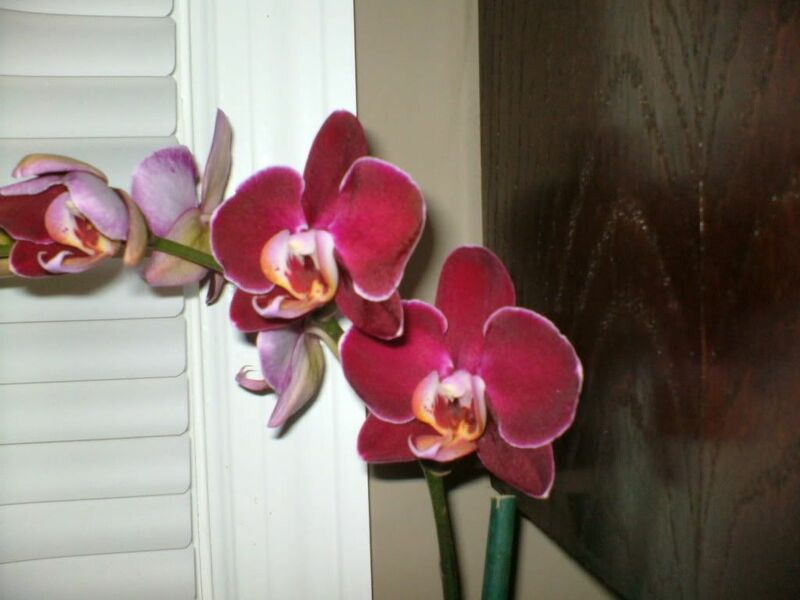 Really they are the easiest of orchids to get to rebloom. I keep mine facing South but not in the direct sun, water once a week in the sink and I spray them down. 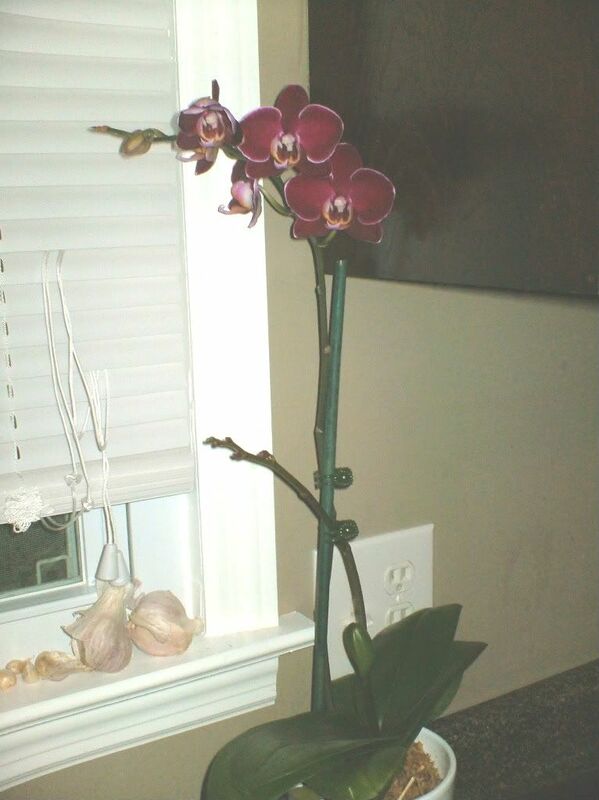 I do use an orchid fertilizer, very diluted, every other week. I don't mist during the winter when the heat is on, I just put them on saucers with glass rocks and keep a little water in the saucer. When the flowers fall off don't cut the shoot off immediately. Keep an eye on it and you may be rewarded with another set of blooms. Cynthia, the common name comes from the shape of the flower. Turn one upside-down and it definitely resembles a moth. Lindsay - SCORE! That's one of the more unusual colour-combos in big-box Phals. As Shadowsmom points out, they're very easy care and quite good rebloomers. But watch out! Orchids can easily turn into an addiction (speaking from experience here - at one point I had more than 500 native species in my orchidarium. Then I moved and I had to donate them all to my local botanical garden.) They're also one of the few things I've grown that my cat refuses to eat, and she's a veggimaniac supremo. They had a yellow one there too! Never seen a yellow one either. I can definitely see this becoming an addiction!!! But I have very limited cat safe areas.